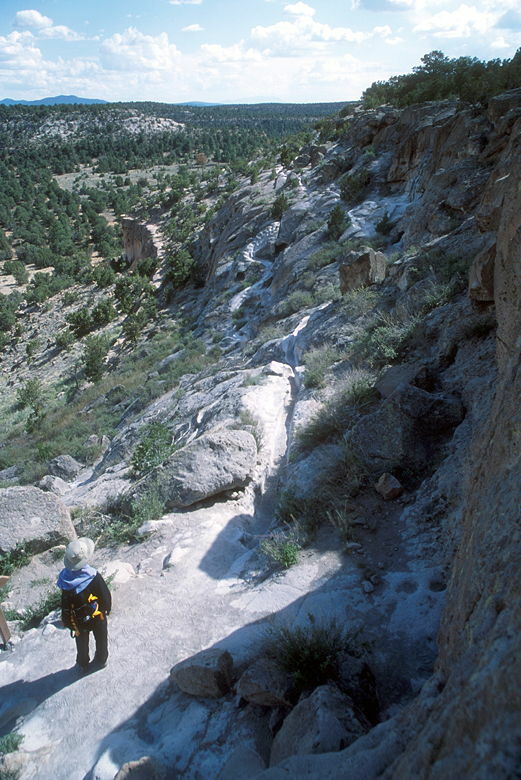 The Tsankawi loop trail sits in a detached unit of Bandelier National Monument. The parking lot was nearly full when we first arrived, but by the time we started our hike it had thinned out a bit, and we hardly saw any people on the hike. I picked up a very informative pamphlet about the trail. Unfortunately it's hard to hike and read at the same time, so I could only read parts of it during the hike. The pamphlet covers 20 numbered signposts, and is highly recommended. Similar to yesterday's hike, we passed through low bushes. There's a bit more vegetation in the area, however. 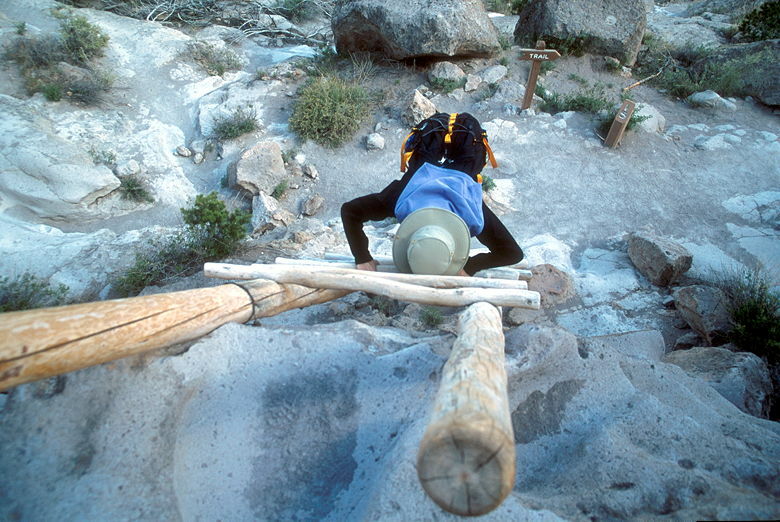 Soon we came upon a wooden ladder which we used to climb up onto the first level of the plateau. 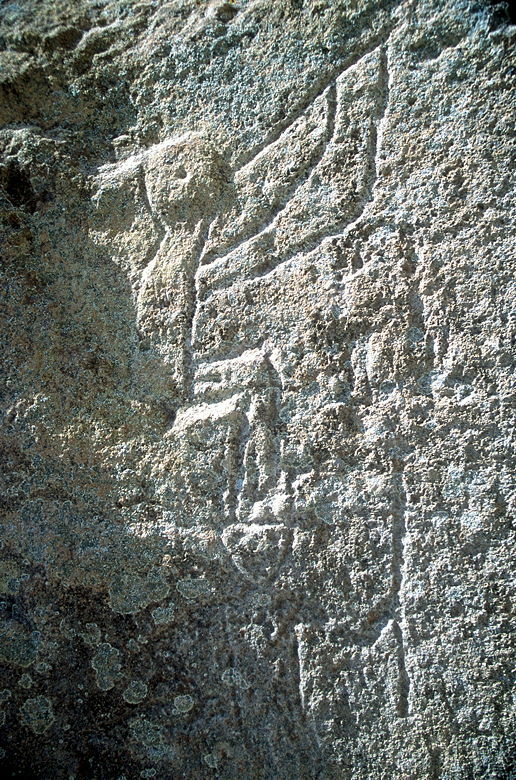 Soon after that we saw a large petroglyph carved in the rock in front of us. 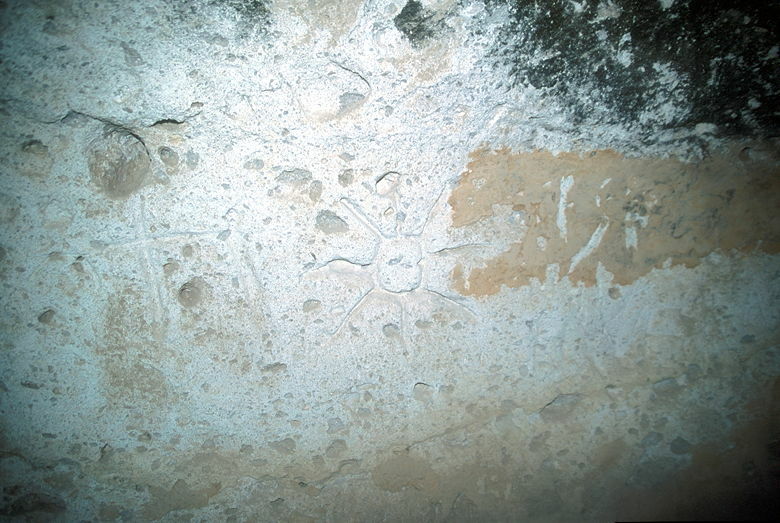 It was just one of many -- they're common all over the southwest, carved by the native Americans who lived here years ago. We climbed a second ladder onto the upper plateau. We walked along until we came to the ruins of the pueblo. 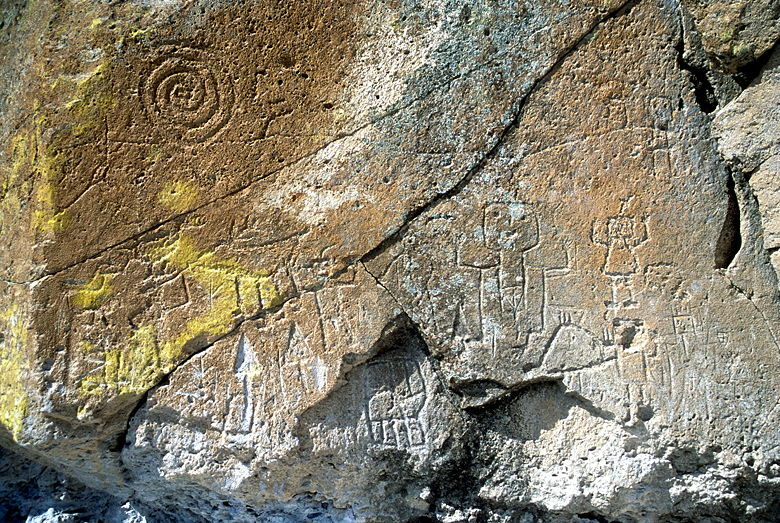 The pueblo was built sometime in the 1400's and inhabited until the late 1500's by Pueblo Indians. There's not much left now -- decaying rock walls, mostly. We had to imagine the 350 rooms and hundreds of native Americans. 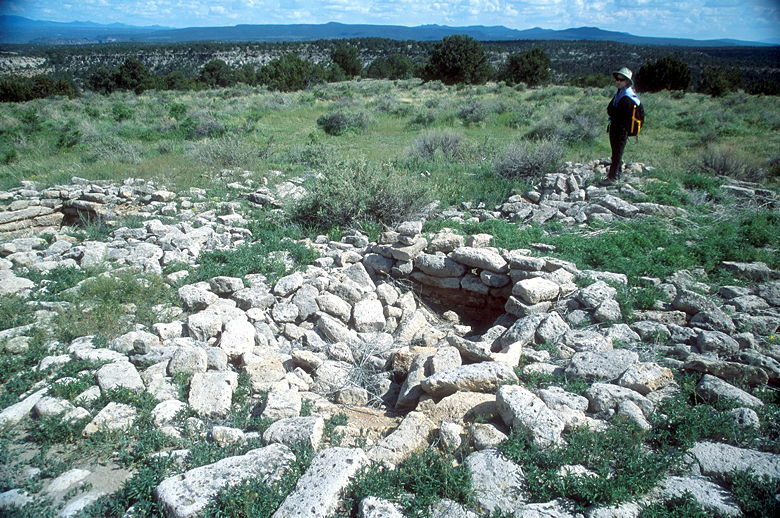 Their descendants may now live in the nearby San Ildefonso Pueblo. The wind blew hard at times but it was very quiet as we pondered their existence over 400 years ago. 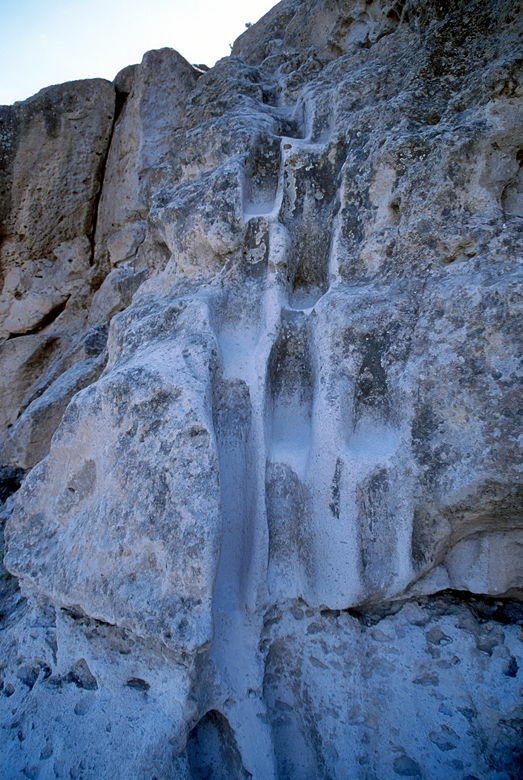 Sections of the trail have been etched deep into the stone by thousands of feet going back and forth to and from their homes. They did have a great view of the surrounding area -- of view of mountains and mesas. We descended another ladder on the backside of the plateau and continued on the loop trail. 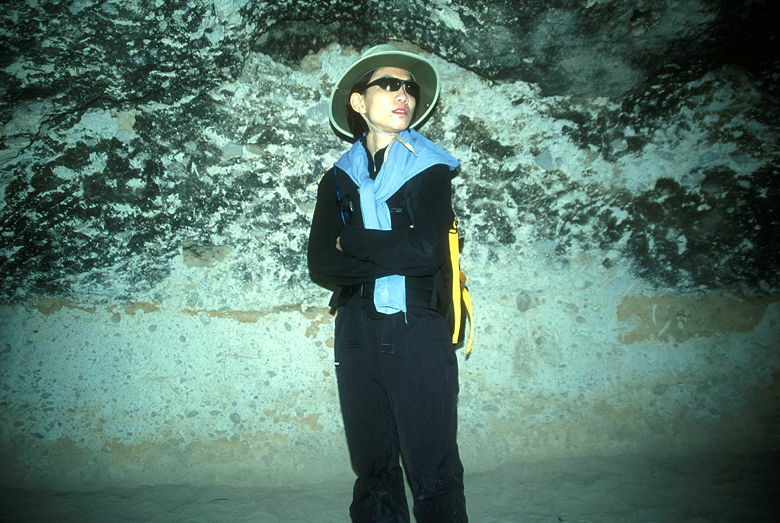 We encountered a small cave with a couple petroglyphs. The top of the cave was darkened by fire. 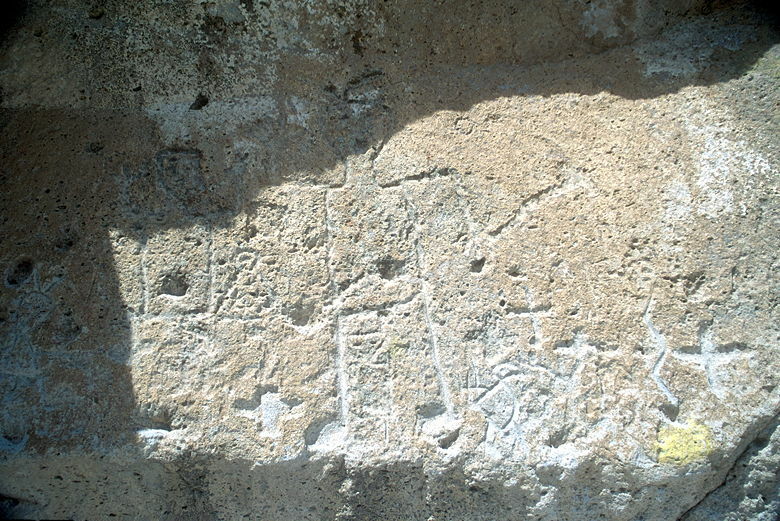 After passing the cave, we became increasingly aware of the petroglyphs, which we spotted near and far along the trail. Stars, animals, even a person playing a flute. We saw a row of holes about 8 feet above the ground. We'd later learn these were for an ancient roof. We continued hiking along the edge of the plateau before descending the first ladder we'd taken and going back to our cars, still trying to imagine what it must have been like to live here hundreds of years ago.